Heidi: How long where you down south? 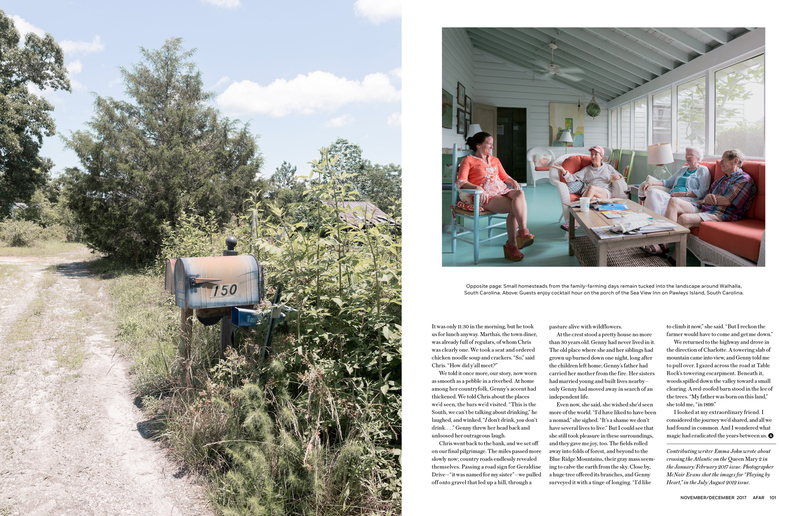 McNair: When AFAR Magazine’s Director of Photography, Tara Guertin, received a story pitch about a Thelma & Louise style road trip through North and South Carolina, she emailed me immediately. Tara knew that I’m from North Carolina originally and had hired me for a project there four years earlier. 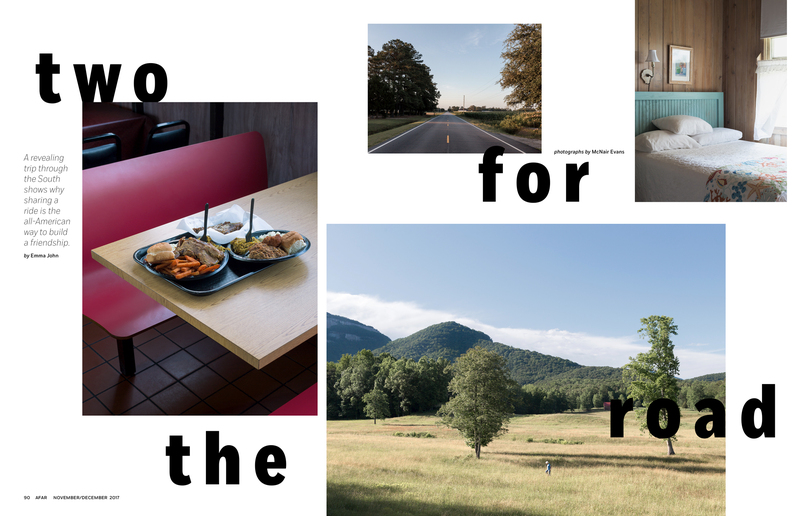 AFAR Magazine takes an off-the-beaten-path approach to travel and photography. To provide in-depth glimpses from remote locations, Tara strives to find local photographers who will share a true sense of place rather than an outsider’s perspective. Not only did this story traverse my teenage haunts, it was pitched by British journalist Emma John, with whom I worked in 2012 on a project titled Playing By The Heart. Tara wanted to know how soon I could schedule the shoot. 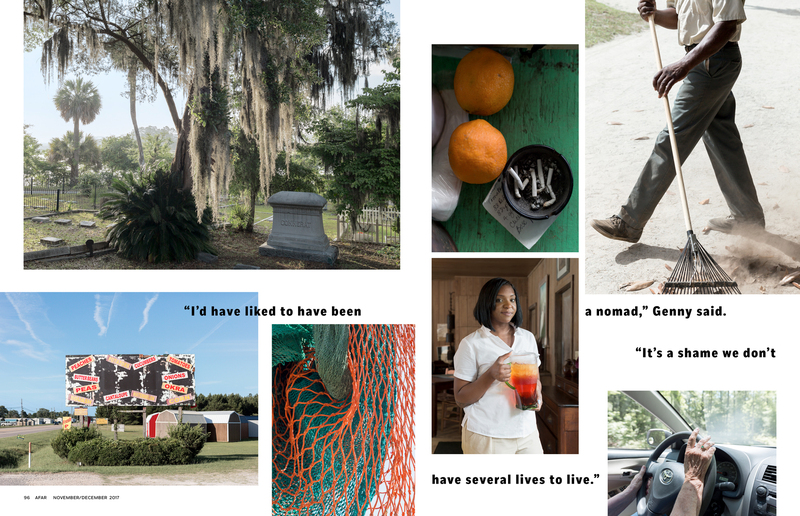 Working with an assistant to help with driving and equipment, I scheduled five days to retrace the story’s route and make pictures that would share the author’s experiences as well as my own sense-of-place as a native Southerner. Was this a road trip? 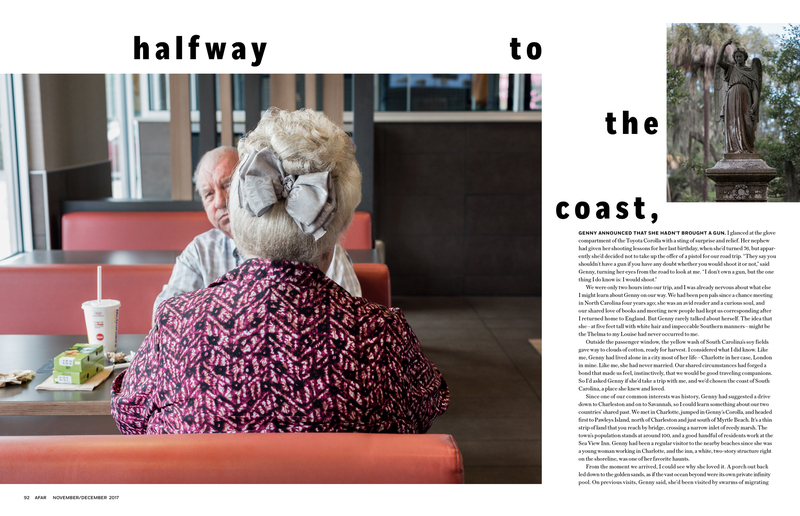 The story Two For The Road consists of first-person experiences and revelations along an 800-mile road trip through the American South. Beginning in Charlotte, North Carolina and driving east to Pawleys Island, South Carolina, Emma and her host Genny crossed the Eastern Coastal Plain, a sandy, prehistoric sea floor currently quilted with large-scale commercial farms and dilapidated agricultural towns. From Pawleys Island they traveled south through tidal washes of the Atlantic Ocean and to the colonial cities of Charleston, South Carolina and Savannah, Georgia. Finally they drove northwest into the Appalachian Mountains for a visit to Genny’s home and to conclude their trip in Charlotte, NC. 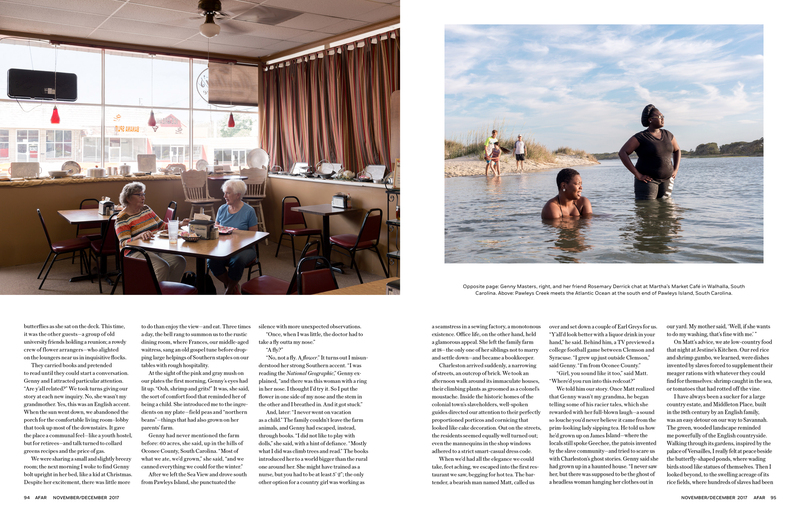 While road trips have long been the means and subject of American photography, photographers have mostly focused on expansive geography in the American West, notions of Manifest Destiny, and isolation or dislocation of photographers navigating disparate locations. This trip was different. The route circled through places often overlooked or challenged me to find greater significance through a manicured veneer of historic preservation. How do you string together your narrative arc for these travel stories? Emma had not yet written her story and would not be able to return to the United States to accompany the shoot. Instead we connected via Skype so I could learn more about her personal experiences and her vision for the finished piece. I needed to know the locations she had visited, where she had stayed, and the people she had met. Emma shared specific encounters with people and places, and I extrapolated the broader significances of these anecdotes. I was interested in the relationship between Genny and Emma and what they had learned while traveling together. What feelings did particular encounters evoke and how did their perspectives change throughout the trip? 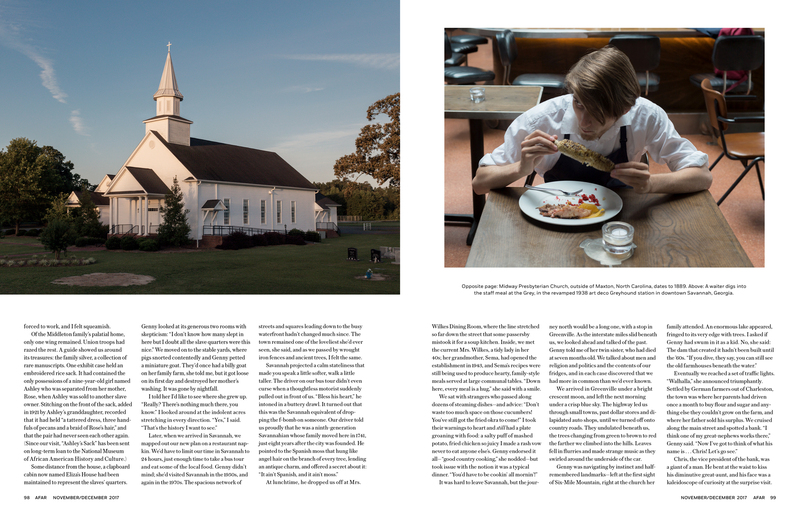 In addition to photographing their itinerary, Tara provided key restaurants and activities that might accompany the article. I made two lists. One consisted of specific places and activities and the other outlined broader themes, such as complex social remnants of a plantation society, challenging gender roles, race relations, social privilege, and generational expectation. My narrative goal was to find the latter in the former while maintaining a sense of discovery and movement through the landscape. How many of these are set up shots and how many are you observing? While trees, mountains, and buildings may not visually acknowledge the presence of a photographer, most people do. The idea that I might photograph people, regardless of how discrete, without influencing their behavior is something I’ve mostly given up. In most cases I prefer an opposite approach that begins with my introduction and explanation. Once a scene or scenario unfolds, I tend to photograph with little, if any direction. Portraits of individuals and still-life images often require complete direction. Otherwise, the instant a person realizes that they are being observed can provide a picture’s punctum. In this last scenario, I then explain my presence and intention in order to receive their permission to publish the image. This project required a variety of image making processes, from completely set up shots to found objects and fleeting moments. Did the writer wrangle the subjects? Emma, the writer, was in another time zone and on a different continent, so ‘the subjects’ were subjected only to direct enthusiasm and mutual respect from my assistant and me. I mean, projects like this, when a photo editor provides a loose shot list and then instructs, “just go and do your thing,” are a complete dream. Sure, all the details regarding where, when, who, and how to shoot become my responsibility, but with that comes the creative freedom to explore metaphor, symbolism, and allegory within every shoot scenario. Tell us about the sharing a ride component, how did you address that photographically? To photograph six cities and 800 miles in five days is no joke. Luckily Mark Quinnes, the San Francisco-based photographer who assisted me on this project, was a quick study on driving manual transmission. Mark would drive between locations and when the light was good. I’d look for interesting stops along the route or photograph through a sunroof. Each night, while downloading and backing up the shoot, we’d use the internet to search local newspapers and websites for interesting events during the days ahead. Mark would drop these onto a Google map previously loaded with our itenary. We’d always have a destination, even if just finding unexpected photographs along the route was our main objective. The main character of this story, Genny, Emma’s road trip partner, met us on the last day. I rode shotgun while she drove and told stories connecting landscape to memory. We visited the site where she was born, her school, a favorite diner, and a site-seeing spot she believed Mark and I would enjoy. Using photography to simply illustrate a story has never interested me much, so a literal picture of her driving didn’t really appeal. Instead, I looked for pictures that might feel like shared moments between her and the absent author. I made pictures that might communicate her belonging, abandonment, and perhaps rediscovery of the place she defines as home. How were you received in these out of the way places? Back in the Bay Area and sharing stories from our shoot, a fellow photographer asked how we could spend so much time with ‘those types of people,’ ie. people so different from us. Rarely are people as binary or different as they appear from afar. Photography, like all art, provides a vehicle and voice to cross these divides. The history of slavery and a persistence of plantation ideology certainly clouds the American South, as well as many places across the United States, but collective guilt and shame can unite us in action as much as they separate us in anger. Photography might not be capable of really changing the world, but at least assignments like this one provide an opportunity to describe underlying nuances that define how we see each other.